Sharkey Funeral Directors maintain all vehicles in pristine condition at all times. The current hearse fleet are Mercedes Benz and the current private ambulance in operation is by Volkswagen. 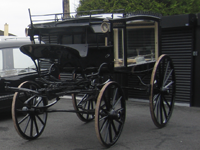 The last remaining horse drawn hearse used by Sharkey Funeral Directors is a Marsden Town Hearse. With horse drawn hearses, a city hearse is quite ornate and therefore heavier and was used primarily within cities and for short journeys. Sharkeys town hearses were used in the last century for most all funerals, with lighter country hearses used for long distance journeys. It was built on the Harrow road in London at the turn of the century (c. 1900) and last used during the Suez crisis in late 1956. It has since been restored to its original condition and may be viewed by request at The Sharkey Funeral Home, Ballaghaderreen.